What on earth is are these Arboresent and Palampore prints? Well get used to them as I am seeing them starting to resurface for trend. The Palampore design is a traditional Indian tree of life design that was for export to Europe in the eighteenth century and very early nineteenth century. Only the wealthiest classes could afford to buy Palampore. A Palampore was made by an artist who drew the designs on cotton or linen with a pen containing mordant and then dipped the textile in dye. The dye adhered to the cloth only where the mordant had been applied. This lengthy process had to be repeated for each color in the design. Small details were then painted by hand on the cloth after the dying process was completed. Palampore patterns were usually very complex and elaborate, depicting a wide variety of plants, flowers, and animals, including peacocks, elephants, and horses. Because a Palampore was hand-created, each design is unique. I am totally in love with them as they have so much content. 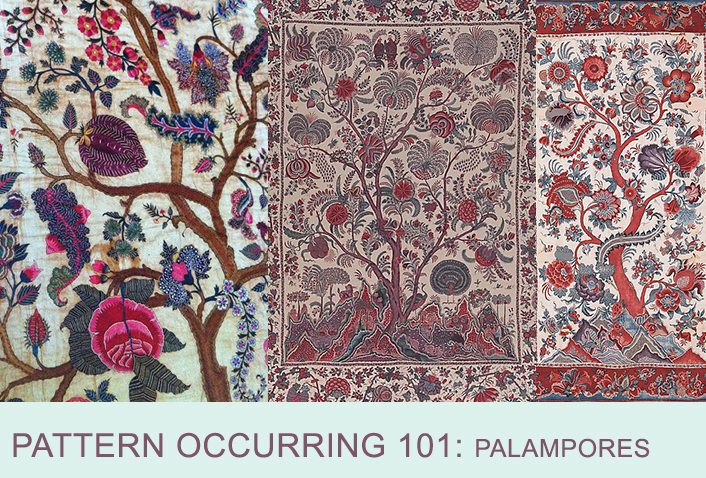 As for the Arborescent prints these were highly influenced by the Palampores a sort of back and forth cultural cross pollination between India and Europe in the late 18th century. Such prints were typically used in home furnishings and depicted heavy sinuous branches supporting large tropical flora and fauna. Wait wait, I totally forgot about these wonderful scandinavian interpretations of arborescent prints. What will the next interpretations look like? I'm guessing dark grounds and pop colours.